Anika Mason—simple name. Brown hair—average color. Blue eyes—she wished they were brown. But somehow she’s attracted the attention of the new boy at high school, and he is becoming quite obsessive and possessive over her. She needs to figure out how to get rid of him, fast. But when she’s forced to lie about having a boyfriend to get him to leave her alone, she gives the name of the biggest player in the school; Brady Morrison. Not only did she not like him, but he barely knew she existed. And now she had to pretend she was dating him. Wonderful. I am going to be brutally honest here, Mine was rather confusing to read and the plot was barely there during parts of the book. Normally, confusing doesn’t bother me but coupled with a weak plot…I barely got through reading Mine. I don’t understand why having a stalker is all of a sudden cool thing to write about. Written about properly, it can be used as a great addition to a story. But in this case, the stalking was….weird. We have Foster admitting that he hacked the cameras in Anika’s house/phone to keep tabs on her and Anika is torn between being concerned that the new kid knows everything about her and being flattered. Instead of telling an adult, she decides that she is going to enlist Brady to help her by pretending that he is dating her. Which made me go “Ok. Stalker boy will not believe that“. And he didn’t believe her. Instead, he brought his stalking up to a new level. What I didn’t like, also, was that there were 5 different 1st person views. I would have been fine with Anika and Foster’s POV. I didn’t think that Mitchell, Sierra and Brady’s POV were needed and, honestly, their POV’s just repeated what was written from other POV’s. I did like Anika but she did get on my nerves. 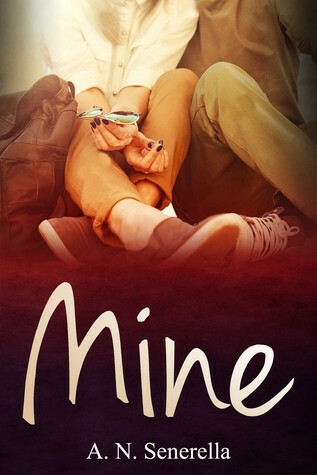 She was so down about everything and couldn’t believe that she had two boys after her…..even if one was a stalker. While she complained about it, I almost thought she was flattered to have someone so into her. What also bothered me was how blind she was to certain people in her life. I mean, if Foster and Brady could see how unstable a certain friend was, I am sure that she could. But she didn’t and when events happened at the end of the book, she was taken by surprise. Foster, I didn’t like. He was a stalker. He hacked into Anika’s cameras and phone to “keep track of her”. He showed up everywhere she went and he tried to go after her friends (Mitchell at the beginning of the book) and he put a kid in the hospital after he caught the kid drugging her (not that I blamed him for that one). He explained his behavior as a homeschooled child with no social interaction, which kind of ticked me off. I know people who homeschooled their children and their kids are not under socialized and they all know how to behave in public. He did do a turn around towards the end of the book but still. The romance really wasn’t there. Both romances felt forced and the Foster/Anika romance just felt wrong. I mean, he was flipping stalking her!!! Like I said, the plotline was thin and lacked in spots. The author did try to bolster it by adding a surprise twist but it wasn’t enough. If the POV’s were whittled down to 2 and more detail was added to the book then I think this book would be a good read. Why: I couldn’t connect with any of the characters and felt the plot was weak.